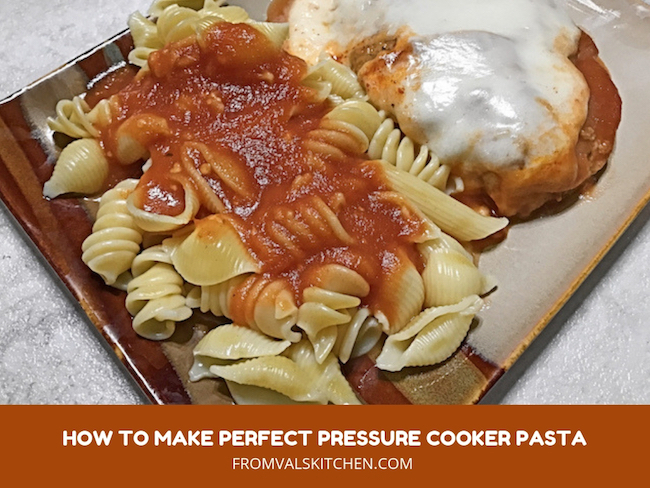 Perfect Pressure Cooker Pasta is the easiest way to prepare boxed pasta without having to stand over the stove while cooking. This simple recipe delivers perfectly cooked pasta that requires no draining, just top with butter or sauce and serve. Pasta is an affordable product that is so versatile that it can be used in thousands of dishes and taste different in each and every one. We all have those nights where we need a quick and simple side dish. We have a box of pasta in the cabinet but don’t necessarily want to stand over the stove making it. Electric pressure cooker to the rescue! 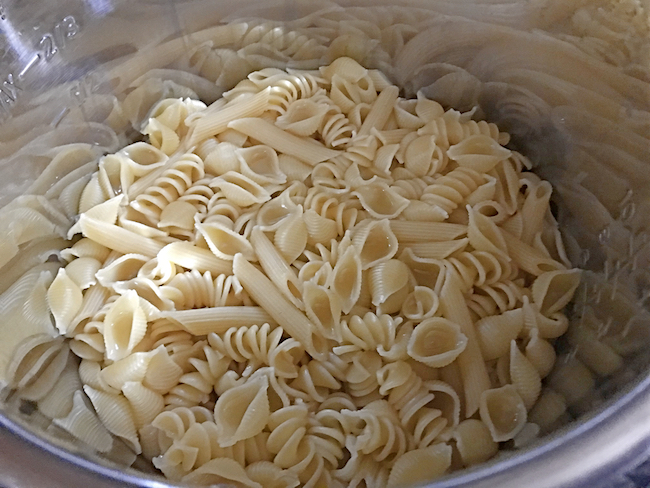 A good number of varieties of pasta work very well in an electric pressure cooker. While I can make most work, I have found that the ones that work best are short to medium sized pasta whose box calls for 8-10 minutes cooking time. This includes varieties such as elbows, shells, penne, ziti, farfalle, rigatoni and others. Generally you’ll be setting your electric pressure cooker to cook for 4-5 minutes, or approximately half of the cooking time specified on the pasta box. Once the cooking time has finished, do a quick pressure release and stir well. A good stir will help ensure that nothing is stuck and to help evenly distribute any small amounts of liquid that may remain in the pot. Top with butter or your favorite prepared sauce and you’re all set. Here’s how I make perfect pressure cooker pasta. Pour the water or broth into the pot. Place the pasta into the pot, making sure you have as much of it as possible (al of is it best) covered by the broth. Place the lid onto the pot and close to seal. Set the pressure cooker to cook on manual high pressure for 4 minutes. Once the cooking cycle has finished, do a quick pressure release. Remove the lid and stir well. This helps ensure that nothing is stuck and to help evenly distribute any small amounts of liquid that may remain in the pot. Top the pasta immediately with your choice of butter or sauce and stir well. 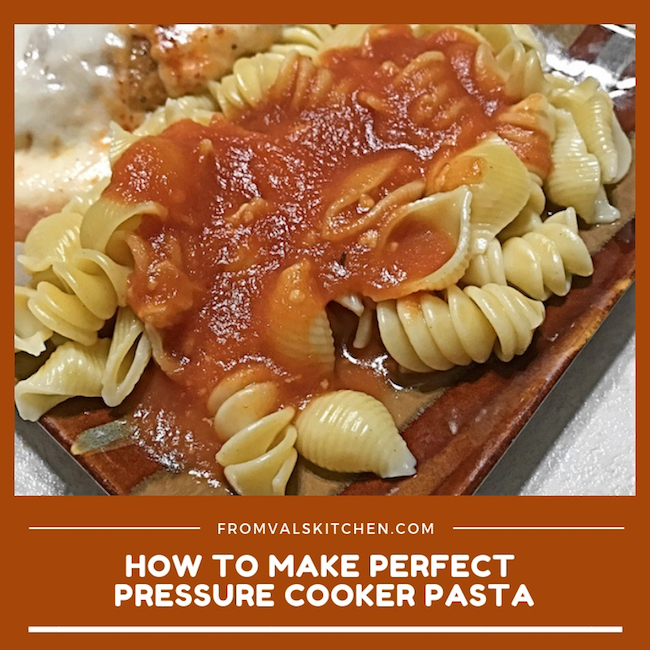 If you are looking for a different type of pressure cooker pasta recipe be sure to check out some of my other pressure cooker pasta recipes! Pour the water or broth into the pot. Place the pasta into the pot, making sure you have as much of it as possible (al of is it best) covered by the broth. Place the lid onto the pot and close to seal. Set the pressure cooker to cook on manual high pressure for 4 minutes. Once the cooking cycle has finished, do a quick pressure release. Remove the lid and stir well. This helps ensure that nothing is stuck and to help evenly distribute any small amounts of liquid that may remain in the pot. Top the pasta immediately with your choice of butter or sauce and stir well. Place in a bowl and serve immediately. Enjoy! I envy you that you use this kind of appliance I am terrified of pressure cookers my mom had one explode once. But I know they are much more advanced and perfected now .. This certainly changed my mind! This is great to know! I have been hesitant to use pasta in the IP. but now I’m gonna give it a go! I have been wanting to buy a pressure cooker for forever now. I never knew you could make pasta in it! Game changer! I want to try this pasta for dinner. This is really a great recipe. Is good food and this looks like one of the BEST! I don’t have a pressure cooker and I never thought it was really something for making pasta. Sounds very convenient! 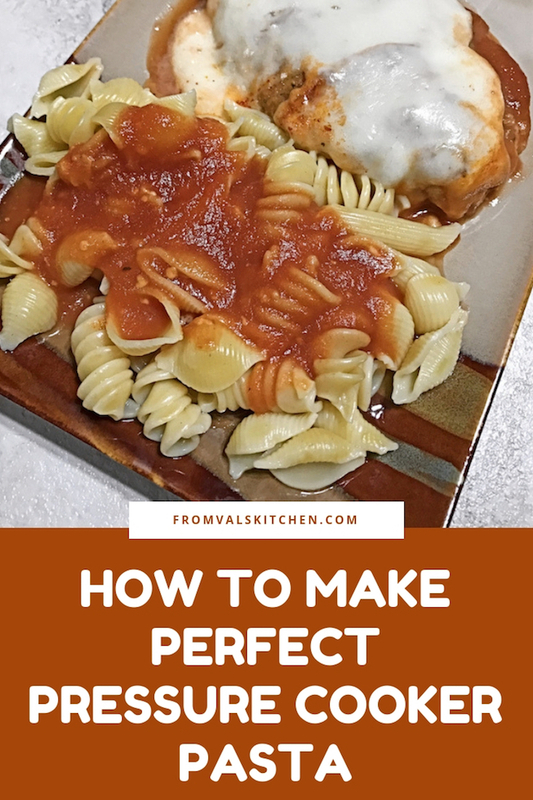 I love making pasta in the instant pot, so quick and easy. I really didn’t know you could make pasta in a pressure cooker. It would be ideal for a person who is short on time and needs pasta ASAP. I gave my pressure cooker to my daughter — I’ll have to tell her. I just got a pressure cooker so I am looking for new recipes, I honestly would have never thought to do pasta in it! My hubby is Italian so I am going to do it when he is not home and see if he notices the difference (ha!) it would be a big time saver for me! Time wow! Wht does pressure cooking do to pasta tecture? I have a pressure cooker but I hardly use it. I must! especially because it really makes this so easy. Saving this for later. Sounds so quick. I’ve never thought of cooking pasta in the pressure cooker but yours looks perfect. Great idea!